While some Republicans want a national ID card….and Arizona has passed law that goes into effect in July that mandates Police Officers to check for ID on any person they stop ….. 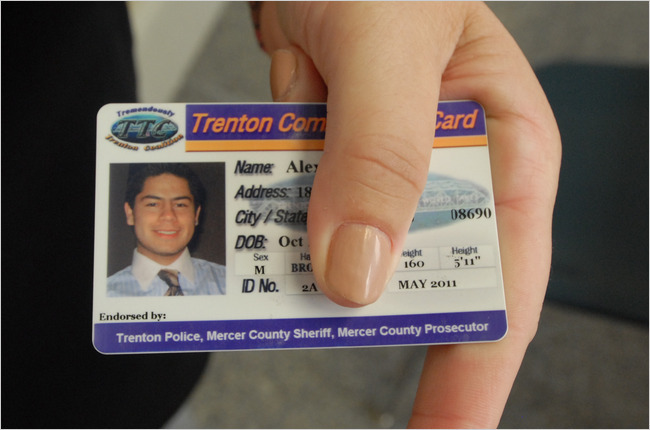 The city of Trenton, New Jersey has joined several other US Cities and stepped up to HELP immigrants obtain a photo ID that can help them to ID themselves and obtain services…. The actions put conservatives and liberal in the same place …but for vastly different reasons…. The matter of practicality seems to have met the way of enforcement….with practicallity winning the day…. Having ID IS very important for several reasons….. Even though the cards are issued by local law enforcement…..
One of reasons for having them… doesn’t have to be to snoop…..
As a new law in Arizona makes the failure to carry immigrationdocuments a crime and spurs similar proposals in other states, Trenton is one of a small but growing number of municipalities that have moved in the opposite direction — making sure that illegal immigrants have documents to make their lives easier. At least six city governments, including San Francisco and New Haven, now endorse or issue photo identification cards to residents. The latest is Princeton, N.J., where advocates for immigrants, with the consent of both the borough and the township, will begin issuing cards on May 22; other New Jersey communities have also expressed interest. Oakland, Calif., has approved a program but has not yet started issuing cards. In one sense, these liberal cities and Arizona’s conservative lawmakers are working toward the same thing, said Maria Juega, treasurer of the Latin American Legal Defense and Education Fund, an advocacy group that spearheaded the ID programs in Trenton and Princeton. Both camps, she said, are trying to fill the void created by Congress’s failure to fix a flawed immigration system. Calls for a nationally mandated identification card have been made for decades, particularly after 9/11, but they received a push late last month when a group of Democratic senators unveiled a blueprint for comprehensive immigration reform. The plan includes a proposal to require all workers, including citizens, to show potential employers a card with biometric data, like fingerprints — a measure meant to prevent illegal immigrants from working. The local identity cards do not grant legal residency or the right to work. They are intended to fold illegal immigrants into the fabric of the community by giving them entree to services and places that require some sort of recognized identification. In Trenton, immigrants can use their cards to access libraries, medical centers and doctors’ offices; seek help from charitable organizations and private social service agencies; and use the city’s public recreation centers and pools.